Generate Savings for Your Company and Help GHEA! Cornerstone Payment Systems and GHEA are pleased to offer a unique opportunity to save your business money on credit card processing, while supporting GHEA at the same time. We call the program Processing with a Purpose™, and a portion of the funds generated from this program will go directly to GHEA. Simply process your credit cards under this program and Cornerstone Payment Systems will make a donation to GHEA for as long as you participate. You benefit! 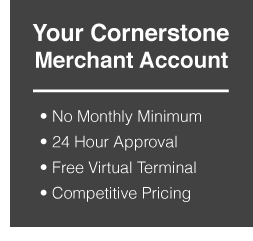 As a participating merchant, Cornerstone Payment Systems will provide you with a preferred credit card processing rate, which is guaranteed to save you money for your business. Guaranteed! We are so committed to the success of this program, that if they are unable to provide you with a comprehensive offer which reduces your processing costs, then Cornerstone Payment Systems will pay GHEA $500!